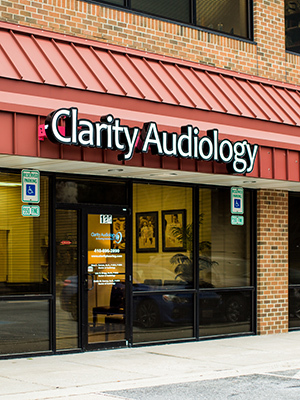 Clarity Audiology & Hearing Solutions, LLC was founded by Dr. Mary Carson in 2010 and is an independently owned and operated audiology practice in Ellicott City, Maryland. Dr. Mary Carson, Dr. Lisa Bragg, and Dr. Emilie Carney specialize in the diagnosis and treatment of hearing loss, and the fitting and programming of hearing aids. Helping our patients improve their lives by improving their hearing brings us great joy and professional pride. The Entheos Audiology Cooperative was built around the idea that practicing hearing health care is a privilege. The model of giving back to the community keeps our passion for what we do running strong, and is a perfect fit for us at Clarity Audiology & Hearing Solutions. The Entheos Audiology Cooperative was established by audiologists who were looking for a way to serve the community, reignite their love of what they do, and grow their businesses through community outreach. Entheos is responsible for helping children in Mexico, Africa, Jordan and Jerusalem hear and communicate better through international missions and the establishment of audiology centers. This model is good for our patients and our community. Members of the Entheos Cooperative must commit to audiological and business best practices, and receive significant discounts with vendors and manufacturers that we pass on to our patients.